Sanqi also called Tienchi (Latin: RadixNotoginseng), it is a well known herb of Yunnan. This herbal nutrient is rich in sapogenin glucosides, the herb is classified by the Chinese Herbal Materia Medica in assisting the cardiovascular system. 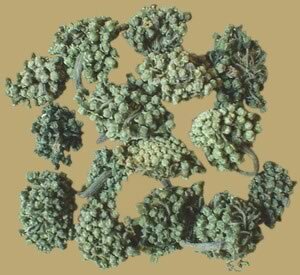 Sanqi flower is an excellent healthy tea, used to treat vertigo, dizziness and relieve inflammation. PREPARATION: To prepare Sanqi Flower, we recommend either a regular teapot or individual steeping cups. Allow 1 to 2 tsp. of the Flower per serving. Cover with water no hotter than 70°C, (158°F) and allow to steep for 2 to 3 minutes depending on desired strength. Sanqi Flower generally may be resteeped 2-3 times.